STAY HERE! OMAHA & LINCOLN NEARBY! A countryside setting with many fun things to do. Relax in our cocktail lounge after city visits. OPEN ALL YR! Only 30 min. from the famous Henry Doorly Zoo, the College World Series Stadium & Cornhuskers Stadium. Pretty nice place in general. HOWEVER - it is terrible that we were not told about the RACETRACK in the backyard of this campground. The NOISE was horrible late into the night. We would never have stayed if we knew. Absolutely inexcusable that we were not warned. A nice facility with many many many unexpected/unadvertised extreme rules. 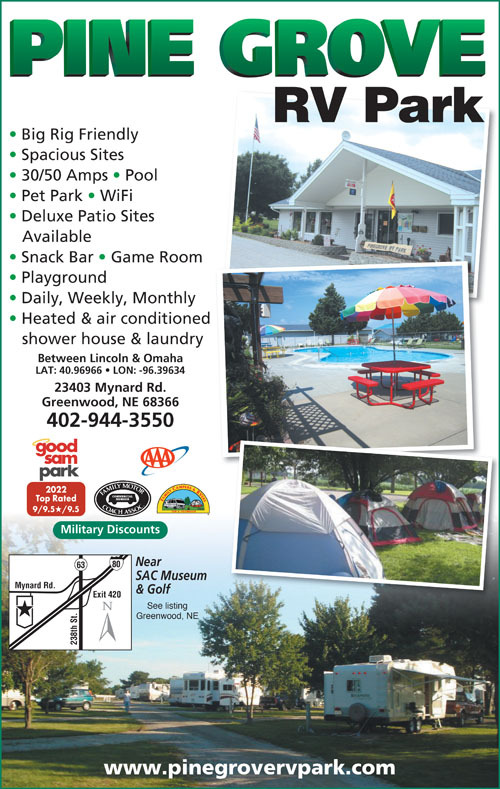 $4 per person/per night for more than 2 campers per rv site. $4 per person/per day for visitors. No outside firewood ... not even locally purchased wood. No food or drink in the pool area ... not even a bottle of water. WiFi for one device per campsite. We intercepted one of our visitor's car being towed (without warning) because it checked in at the office with another vehicle and was given just 1 tag. I was accused of taking 5 unpaid children to the pool ... when in reality I spent 3 hours at the pool with 2 paid adult campers during the entire week we were there. Rules state no camping mats on the grass yet a tent was set up on the grass at an rv site for multiple days. The lack of hospitality was definitely felt by our camping group and visitors from Ontario, Michigan, Arizona, Minnesota, Iowa and Nebraska ... embarrassing to this event planner ... none of these rules were found on their website. Their website says they have sparkling clean restrooms and showers but that was not the case. They smelled horrible, was not very clean, and the showers had poor shower heads and poor water pressure. Shower fixtures looked like something from the fifties and need to be updated. No shelves or hooks to hang your towels or clothes. They also charge extra for people in your party, including your kids that are traveling with you. I thought that was a little ridiculous. The rest of the facility seemed fine. They have a nice pool, sand volleyball court, playground and other amenities. They only complaint about these things was that they would not allow you to bring your own drinks, including a bottle of water, into the pool area. They expect you to buy drinks from their bar. The Good Sam rating is vastly over-rated. This is an average to mediocre park at best. All of the roads from the entry forward are gravel, bumpy and generally uncared for. The trailer sites are un-manicured gravel/stone that has not been cared for in a long time. Weeds are growing on the parking pad areas due to lack of care and no new top stone being added. Although there is green ground cover between the sites, it is mostly weeds. The bathrooms are only of average care and the women's is bad. Of the 3 showers in the women's, one was OK, one was without a clothing hook and one was out of service. That is 3 showers for 118 parking sites. The park is directly adjacent to interstate 80. If road noise bothers you, be ready with your ear plugs. There is no cable. In a new low, they attempt to charge each visitor $4 if they stay more than 1 hour! If your interest is either Omaha or Lincoln, we suggest that you pick another park closer to either of those cities. This is a nice park with gravel pull through and full hookups. Lot was level and roomy. WiFI worked well. Showers are nice with plenty of water pressure and hot water. There is a small store and restaurant in the main building, but, we did not eat there. Pleasant staff. I enjoyed the quiet country setting. We would stay here again. Nice park between Omaha and Lincoln, but nothing close by. Just off I-80. Gravel roads and sites in pretty good condition. On exiting the park, about 6 speed bumps. Some are angled that make the RV twist and turn. Don't know why they build them that way. Bathrooms are in very good condition. Plumbing is old, but new tile floors and showers. Overall good condition. Full hookups, but no cable TV. Can pick up a number of channels on antenna. Picnic table at site. Overall good spot to stay. This park is a keeper. Will return and stay much longer. Great park set up that makes it easy to maneuver a large rig into your spot. The staff is very friendly and accommodating. Very clean pool area and a great kids play area. Large dog park. Price was very nice. Pretty nice campground except for the rude employees. Way more rules of what you cant do than what you can do. Also pool is never open after it rains, i quess the rain makes the water unswimable!!? Save your money plave is garbage. Stayed only 1 night. Next to freeway noise all night, Good long pull thru, Good service, No cable service. Office closed during lunch. Has box for late check-in . Has store & Bar. (get a 50 amp pull thru with sat, service its a little distance from freeway.) Will stay on return trip. This is a great campground. Right off the highway so very convenient for one night. Try and get a site away from highway, we didn't even hear the car noise. Clean facilities, restrooms and showers. They pick up your trash. Nice office with food and drinks. We enjoyed relaxing after driving with beer and big screen TV. Employees friendly and helpful. We stayed 2 nights on our way from west coast to midwest. Nice grass at sites. After the south west and CA, the grass was notable. Restrooms are clean, painted a bright white. Showers are fairly easy to use, place to hang stuff and a stool. Hand dryer was old, and did not always turn on, had to push the button just right to make it work. Lots of signs about closing doors, some made sense. The winds are powerful in NE, and bathroom doors that are not closed can blow open and get damaged, or let in lots of debris. The signs in the restroom to close the doors on the toilet & shower stalls did not make as much sense, unless they too bang if someone leaves the door to the outside open. Excellent facility. 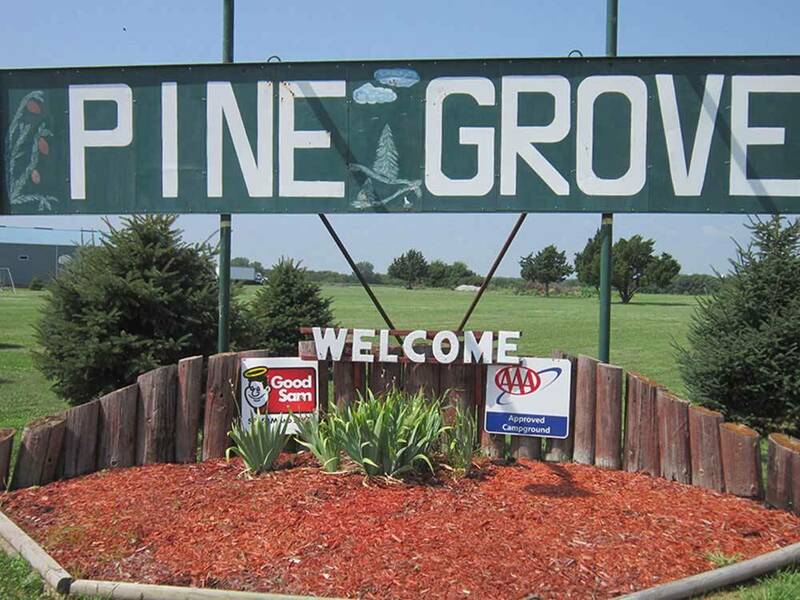 Pine Grove has everything an RV'r can want or need, full hookups, wide sites, and amenities include a lounge with snacks, various brews, and a large screen TV. The hosts are a military family, and give discounts to veterans & active service military. They are very helpful, considerate, and friendly. A very pleasant stay, at a wonderful campground.